In the May 19th conclusion of ECCE Ensembles’ two-year residency at Kendell Square’s Le Laboratoire, cross-cultural influence and dialogues will permeate. Ecce has already explored French composers Jean-Baptiste Barriére and Frank Bedrossian, as well as the excitingly imaginative opera by ECCE’s own John Aylward. 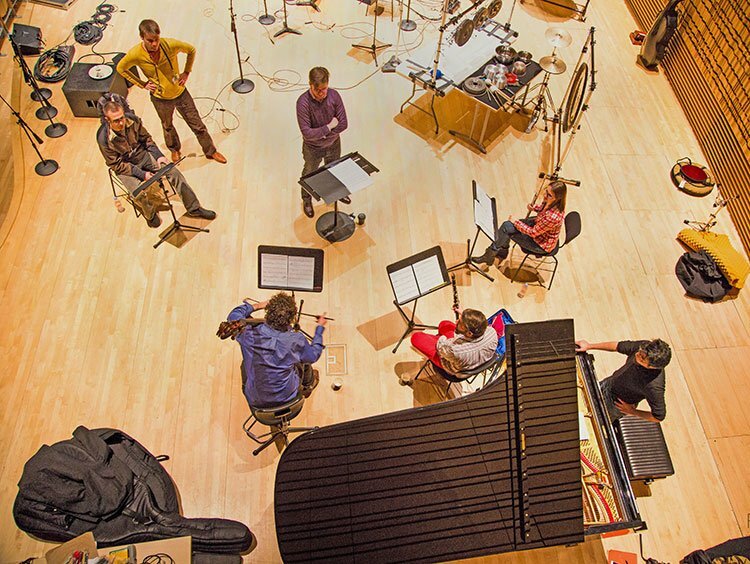 Rather than simply contrasting the somewhat disjunct ideals of American and French artists, the ensemble has emerged with a connection-filled community which plans to offer musics of a fearlessly cross-disciplinary and exploratory nature. On May 19th, ECCE’s pairing of compositions by Philippe Hurel and John Aylward will further offer a clear exposé on influence and homage. Hurel’s Pour Luigi and In Memoriam a Berio showcases his admiration for the iconic champions of contemporary European music, Luigi Nono (1924-1990) and Luciano Berio (1925-2003). The world premiere of Aylward’s homage to mentor and guide Lee Hyla, Angelus Novus, plays a central role in concluding this residency. Aylward’s Daedalus (2014) rounds off the program. 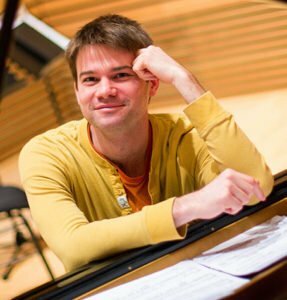 For BMInt, Aylward elucidates ECCE’s residency and the French-American connection, while providing a sneak peek into its spring concert. D.S. : In your two-year residency at Le Laboratoire in Cambridge, you have been able to put on a variety of projects of both a cross-cultural and cross-disciplinary scope. What was your focus this year? For some time, I have been interested in having Ecce doing more than just a series of concerts. That’s been the thrust of our residency at Le Lab, where we embed musical events into the installation gallery programming so that people who would not necessarily think about attending a contemporary music concert, but would think about French culture, or the Lab, technology, innovation, and all that’s surrounding Kendall Square, might experience our music. That is one way I see to widen the circles with contemporary music enthusiasts. You can’t do that just by putting on a contemporary music concert and passing out fliers: you have to embed your output in the community in an interesting way and you have to make connections that other people outside the circle of contemporary music react to. And of course, it has to be a great show so that it thrills and enthralls and is an accurate representation of the music. The concert pairs your music with two works by Philippe Hurel. What went into deciding to program your music with the Frenchman? We decided this last event would connect some of my music with some of Philippe’s [Hurel]. Philippe was a guest composer at our 2012 Etchings Festival in France, where he and I taught alongside each other. This season, Ecce looked back on many Etchings Festival alumni, commissioning them and featuring them in other ways. This final concert of our season seemed like a fitting way to bring Hurel’s music to the US. Philippe does not have as much of a connection with the US as Jean-Baptiste [Barrière] or Franck [Bedrossian], so we thought that this time we would have French and American works alongside each other. I think Hurel is a composer whose music pairs with mine in interesting ways. Hurel has absorbed a lot of American influence. His has integrated a deep appreciation for American jazz and its vibrancy and pulse in his own personal way. Similarly, my relationship with French Spectralism of Grisey, Murail, or Hurel mirrors this cultural bridge. The pairing of our pieces is less juxtaposition and more about how our compositional processes began by engaging our roots and then branching out toward something more international. Much of your residency and this specific concert seems directed towards examining a cross-cultural dialogue and this French/American musical history. What is your own personal history with France? It started with Henri Dutilleux, with whom I shared a wonderful correspondence at the end of my graduate school experience. He engaged my music quite a bit and urged me to open up my color palette. He definitely wanted me to think about and embrace some of the distinct features of modern French music, of course, but he also heard that there was room in my music for more color. What I learned from knowing him, was that it would be ok to branch out and not worry too much what will happen to my core musical self. I grew up on a healthy diet of American composers, and I was starting to understand I could embrace more international language and be free from the burden of cross-examination. Philippe must have started to feel the same way when his language began to grow out of his Spectral roots. The idea of how composers engage internationally has really been the subject of Ecce’s residency at Le Laboratoire, highlighting how they dialogue with each other. Composers forge their own identities in the crucible of all the other music out there. Whether you’re French, going to America or vice versa. It seems that my generation of composers is really in a position to bring out these relationships. One other influence on opening my musical language was jazz pianist Kenny Werner. His book “Effortless Mastering” is a great read about not stifling yourself. He asked us to ‘try and write a bad piece’. We sometimes get block from fear of disappointing audiences. I still talk to my students about that. Writing is revision. It’s going to be bad at first, even needing a 3rd, 4th, or 5th draft. How do you take 10 years of French influence and incorporate it into your own compositional identity? It has taken me a long time to integrate Hurel’s journey with my own influences. Residing at the Etchings Festival in France has been a really important. I can’t understate the importance of becoming so deeply connected to the French musical traditions past and present. My voice comes out of an Americans path. What do I want to do with that? I want to harvest all of the international influence I’ve been given and integrate it into this foundation. I hope my music is heard as being rooted in something American, yet really informed and expressive through all these interesting international traditions. Your Angelus Novus will be premiered at this concert and will demonstrate that strong spirit of collaboration across mediums. With whom will you be collaborating? Angelus Novus, the central piece on the concert, comprises nine songs, and functions like a monodrama. It will feature the expressively talented and young local soprano Nina Guo. This is her first time with Ecce and we are really excited to have her on board. There’s also some choreographic elements too: we have a dancer, Colin Gee, who interacts imaginatively with Novus. We are also engaging with a local artist, Steve Taylor, who is a videographer and animator and will provide visuals for the event. Angelus has grown into another interdisciplinary event with choreography and video, seeming to be a perfect fit for the lab. The current installation, “Life in Picoseconds” by the French artist collective Millimetre, will make the performance backdrop. What are its expressive content and influence? The nine songs all reflect on a source text of Walter Benjamin’ s description of Paul Klee’s Angelus Novus. The central image of the Angel of History is shot through all the other complementary texts in the work. I started to think, as I was writing the piece last year that this issue of our collective future has become a really important part of our national dialogue. In “Art in the Age of Mechanical Reproduction,” Benjamin discusses this idea of the Aura, which is inspired by Klee’s Angelus Novus. It explores how authenticity and uniqueness gets confused in a technologically driven era. Benjamin’s writing prompts me to search for truth and clarity, and I refocus and contrast his ideas with texts from Joseph Campbell, DH Lawrence, and Schopenhauer. Connecting this back to my compositional influences, Lee Hyla was the first person to introduce me to the writings of Walter Benjamin when I studied with him at the Atlantic Center for Creative Arts in Florida. Hurel’s two pieces and and Angelus Novus pay homage to composers that have come before this generation. Hurel’s reflect his admiration of Luigi Nono and Luciano Berio, while yours pays tribute to Lee Hyla. What do these connected homages bring? Philippe’s tributes are to composers that he really looked up to. And it’s really the same with me. Composers outside your own tradition with stark stylistic dissimilarities can really teach you a lot. I didn’t interact with Lee Hyla much, but he made a big impression on me. Lee’s influence brought me to a more individual way of enacting my creativity. So, the similarities among the works rides on the focus of formative figures and mentors beyond the direct teacher-student paradigm. Rounding of the program is your Daedalus (2014). How does it relate to Hurel or the French culture? Daedalus runs in very much in the same vein as the other items we will offer: it reflects a kind of French / American internationalism, taking aspects of Spectral writing and folding them into something that I find more personal. It harvests a lot of sounds into a soundscape that I’m trying to focus. What are your thoughts about Le Laboratoire, having collaborated within that space for almost two years now? It’s really is a tabula rasa: an open gallery space that allows us to dream and create within the space. When David Edwards, the founder, asked us to play, no one imagined we would end up putting on an opera there. David let us take risks, expressing great openness to innovative artistic ideas; I learn a lot from watching him. It’s so easy to access, and it has been quite exciting to see those without a lot of exposure to classical music, come to experience something new. You go two doors down to the café and have a drink. We lose sight sometimes that classical music is about community. And that gets us back to conversing on how we create an artistic culture that engages. The Lab is a perfect venue for that. David Stevens is a Boston-based saxophonist and woodwind doubler, recently graduated from NEC with a double master’s in saxophone performance and music theory. In addition to performing, he spends much of his time as an educator, arts administrator, and theorist. Friday, May 19th at 7:00 p.m.